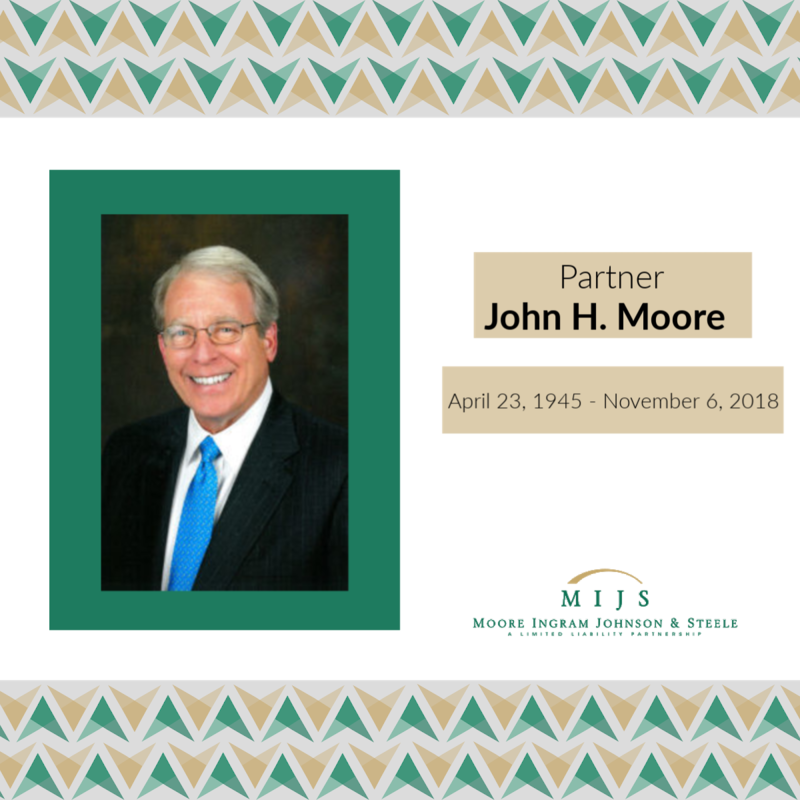 Described by one of his peers as a “real titan in the legal industry,” Marietta Attorney John Moore, founder of Marietta-based law firm Moore Ingram Johnson & Steele, died Tuesday morning of cancer, according to his family. He was 73. Moore founded the local firm, which today stands on Roswell Street, in January 1984 and had practiced law in Cobb County since 1970 after receiving a law degree from Mercer University, according to his biography on the firm’s website. His firm today has just under 100 lawyers across five states. Moore is survived by his wife, Robin Bradley Moore; his three children: John Kevin Moore (Ginny), Traci Moore Shropshire (Chip), and Bradley Allen Moore; his brother, Richard W. Moore (Mitzi); sister, Ceil M. Mattingly; and several grandchildren. Services for Moore have been scheduled Friday at First United Methodist Church of Marietta, 56 Whitlock Ave., with visitation at noon and a service to follow at 2 p.m. Arrangements are being handled by Mayes Ward Dobbins Funeral Home and Crematory of Marietta. In lieu of flowers, Moore’s family is requesting that donations be made to the First United Methodist Church of Marietta or WellStar Hospice in care of WellStar Foundation, 805 Sandy Plains Road, Marietta, GA 30066. A past president of the Cobb County Bar Association, Moore was recognized on the 2017 Best Lawyers in America list in the specialties of Land Use & Zoning Law and Litigation, according to the firm’s website. His death comes just days after that of Harris Hines, who served as chief justice of the Supreme Court of Georgia before stepping down this summer. Cobb Commissioner Bob Ott said he had known Moore for more than 15 years. Though Moore often presented real estate issues in front of county commissioners and the Cobb Planning Commission, Ott said their interactions were not just limited to county matters. Beyond the work at his firm, Moore had also been the driving force in the creation of the MIJS Scholarship Foundation about 12 years ago, with more than $300,000 given since its inception. Recipients of the foundation’s scholarships would be given either $5,000 or $2,500 each year over the span of four years, with the funds generally given to students who could not afford to go to college other-wise. Attorney Garvis Sams of Sams, Huff, Larkin and Balli worked in the same field as Moore, often seeing each other at county and city zoning meetings.